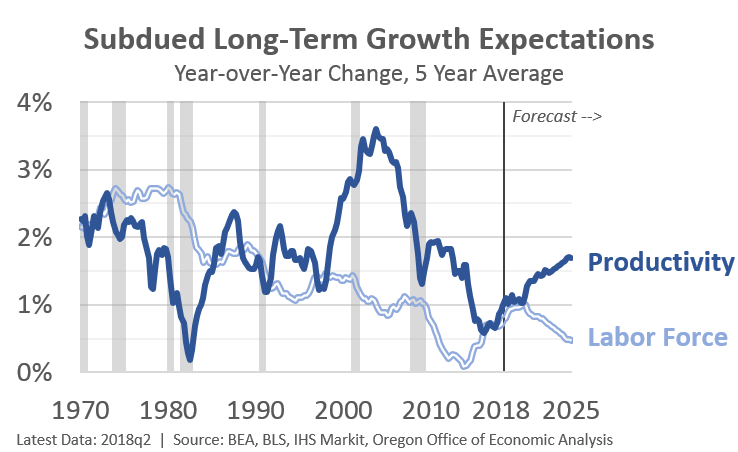 Right now, even as the economy is hitting the sweet spot, long-run growth expectations remain subdued. This does not mean the economy cannot have a good year or three of growth, let alone a strong quarter or two. However, economic output can be thought of as the number of individuals working, how many hours they work, and how much they produce every hour. The reason why long-run growth is forecasted to be slower than in the past is because these factors are currently growing at very slow rates. And they are expected to continue at slower rates moving forward. See Jason Furman’s summary for an accessible deeper dive into these issues and trends. Out of these factors, the one that is least understood, and possibly the most likely to differ from forecast is productivity. Economists are increasingly researching and discussing this substantial slowing in productivity, but have yet to reach a clear consensus as to what is driving it. The fact that the slowdown in productivity is worldwide, and not just in a specific country or two further complicates the analysis. That said, there are a few encouraging signs in terms of new business formation, and research and development spending, that could — I stress could — potentially lay the groundwork for better productivity gains in the future. Another potential factor is the tightening labor market. When workers become more expensive (higher wages), businesses may invest in more equipment and software to offset those costs (replace workers with technology). Should these productivity gains come to fruition, then longer-term economic growth prospects would certainly be raised, and would also allow for more wiggle room for the Fed to navigate through the current danger zone, as Tim Duy recently discussed. 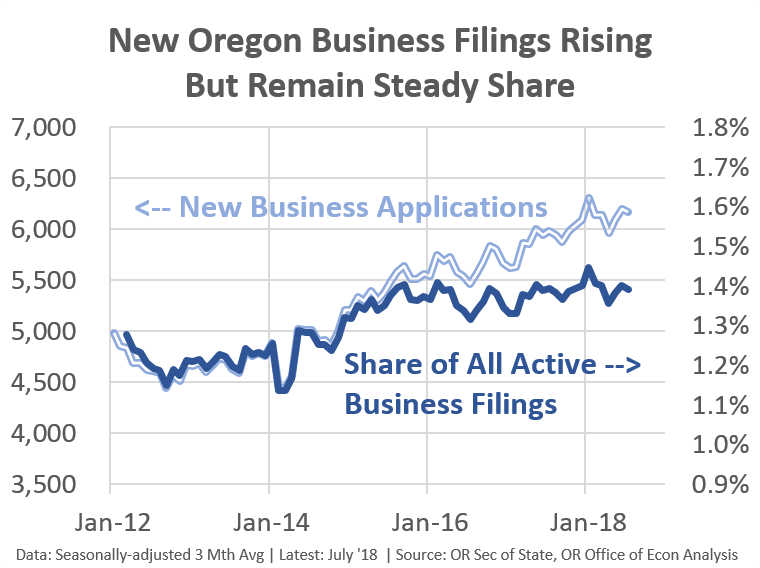 First, new business applications here in Oregon are on the rise. They now exceed the numbers at the peak of the last expansion. The upward trend in the absolute number of new businesses is encouraging, however start-ups are a smaller share of all firms than in the past. These business applications are an imperfect measure. However the good Census data comes with a considerable lag. And the program was revamped not too long ago. New state level data on firm age has not been released in years at this point, so our office is focusing on more timely measures to help gauge recent trends. See our previous report for a more in-depth discussion. Furthermore, these trends in recent years provide zero guarantee that productivity will actually accelerate. 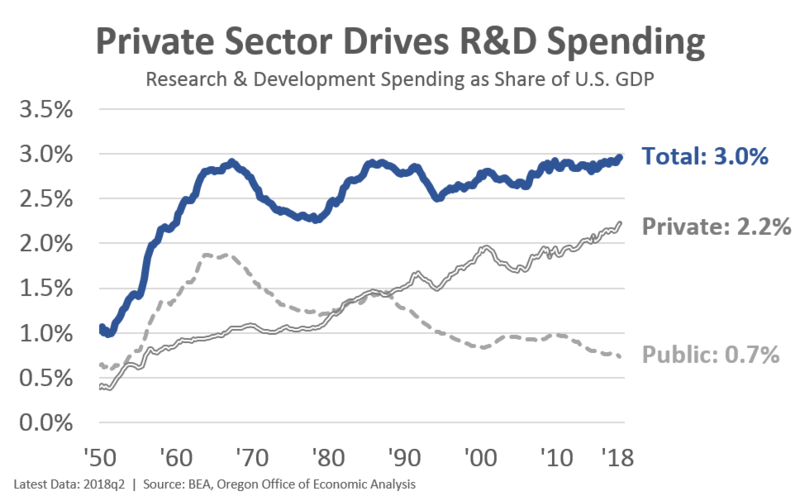 For example, even as spending on R&D recently hit a historic high in terms of the share of GDP, it has been operating in a fairly narrow band in recent decades. While this is true at the top line, there has been a clear shift in R&D as the public sector pulls back – especially following the winding down of the space program and the cold war – and the private sector steps forward. The upward march in private sector R&D is encouraging. Now, what really matters most is the return on or success of this R&D spending, not just whether it happens or not. The decline in start-ups and in productivity is well-documented, if not well-understood. Stay tuned for a follow-up post in the coming weeks where I will dive a bit more into our office’s expectations on the role of technology, automation, and productivity in the economy. There is quite a bit of chatter, and some genuine concern that there is a coming wave of technological change that will drive up unemployment. In our view, it is not so much about being a techno-optimist, or techno-pessimist, but rather being a techno-realist*. * Credit for techno-realist goes to Gail Krumenauer, economist with the Oregon Employment Department. I am just borrowing her great phrase and am jealous I didn’t come up with it. You can get firm age from Census LEHD through 2Q 2017. So you might want to look at this source to keep tabs on firms 0-1 years old, any age you want to look at. Thanks Guy. Does LEHD have firm counts/characteristics? Or just employment? The Census data also goes from the 1970s through 2014. The 2015 numbers are incomplete, in terms of what Census is producing. It has been the best source of information on firm births and deaths (not just establishments).